MyDigitalDiscount is running a limited time sale on the MyDigitalSSD BPX Pro to get some inventory moving. The sale began November 1st at 6pm PST / 9PM EST and is eligible for AMD Prime Shipping. MyDigitalSSD Bullet Proof eXpress (BPX) Pro NVMe SSDs offer sequential speeds up to 3.4GB/s read and 3.1GB/s write with high 4K random speeds making it an ideal drive for gamers, DIY PC enthusiasts, overclockers, and graphics professionals. The BPX Pro is powered by the latest Phison E12 PCIe Gen3 x4 NVMe controller that has been paired with Toshiba 64-layer BiCS3 3D TLC NAND flash. No encryption mode is available on this drive, but 99% of consumers aren’t worried about eDrive or TCG Opal support anyway. We have some BPX Pro drives in-house for testing and they are looking great. The reason we aren’t publishing the reviews is that new firmware is due out in just two weeks and we are waiting on that to bring you the most accurate performance numbers. Just this morning we ran some benchmarks on the BPX Pro 1TB drive on the ASUS ROG Maximus XI Extreme Intel Z390 motherboard (UEFI 0602 from 10/31/2018) with an Intel Core i9-9900K processor and the results were impressive. 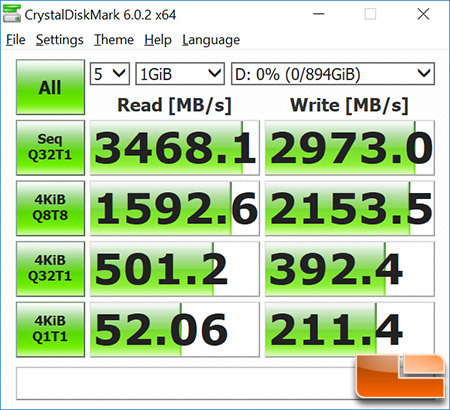 On CrystalDiskMark with the 960GB drive we are seeing 3,468 MB/s sequential read and 2,973 MB/s sequential write speeds. We are performing better than than the drives rated read speed and just slower than the drives rated write speed 4K performance on CrystalDiskMark was also solid with 52 MB/s read and 211 MB/s write. On Anvil’s Storage Utilities we got an overall score of 15,600, which is excellent. The 4K QD16 Random IOPS looked very good with 485,300 IOPS write and 167,100 IOPS read. The 1TB drive is normally $259.99, but with the 23% off promotion code it brings the final price down to $200.19 shipped. That comes out to being around $0.21 per GB, which isn’t bad at all. The Samsung SSD 970 EVO 1TB is $277.99 shipped, the WD Black NVMe 1TB drive is $259.99 shipped, and the HP EX920 1TB drive is $221.99 shipped. 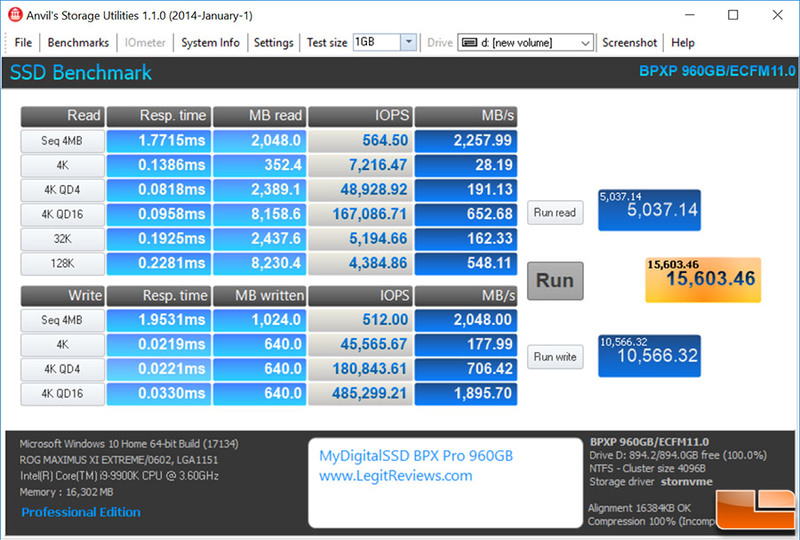 That makes the MyDigitalSSD BPX Pro one of the best priced high-performance 1TB drives on the market today! You might not want to miss out on this limited time sale. The MyDigitalSSD BPX Pro has a 5-year warranty and Amazon has a fairly generous return policy, so with these prices and at this retailer you can’t go wrong.